The current crisis in Russia is the perfect time for investment and creating a new model of development. Switching to technology exports would help the country overcome the crisis as fast as it can, speakers at the Gaidar Economic Forum in Moscow told RT. Although the current geopolitical issues and the situation on the global oil market have created hard times for Russia, it should be born in mind that every crisis can be turned into an opportunity, says Professor Danica Purg, President of the IEDC-Bled School of Management in Slovenia. Talking about the risks of partnering with Russia she said now is the best time to start investing. The crisis the Russian national currency is going through may bring some positive effects in the long-term, says Santiago Iniguez, Dean of IE Business School in Spain. He added that whenever there are differences between countries at the political level, it’s a perfect times to establish business links. 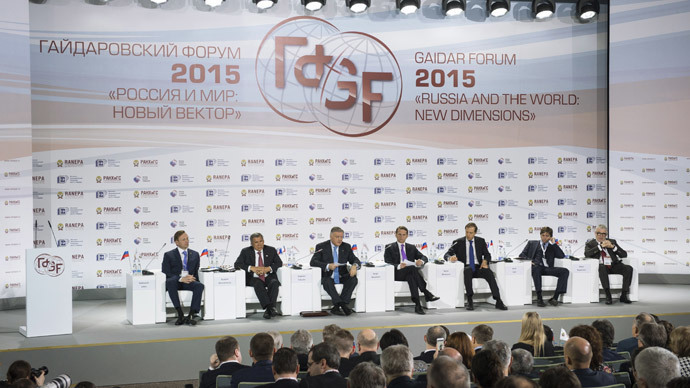 Russian Prime Minister Dmitry Medvedev said Wednesday at the Gaidar Forum that the Russian economic model based on energy and raw materials is exhausted. He said the country should operate in a framework of the National Technology Initiative, which defines the most promising technological niches. "We have much to offer in the field of information technology, nuclear power, aircraft and aerospace industry, and in several other areas," he said.